Loops are treated with whipstitching one or two obrazkami, made from vetochnogo cord (rolica). Processing whipstitching. The fabric at the location of the loop is cut in an equity or a transverse filament (cannot be cut at oblique direction); the buttonhole should equal the diameter of the buttons. Loop through the overcast edge of the cut with a thin thread in the color of the product. To lay the loop from left to right starting with the bottom edge of the incision, securing the thread without a knot (Fig. 497). When the buttonhole needle into a section of the loop and pierce the fabric from the bottom, grabbing 2-3 threads, then the needle tip from the left ear to the right throws the loop needle and pull the thread to tighten the knot loops. When the inflorescence emerge loop cut should lie freely along the finger, and the string coming from the knot loop, we need to hold the middle finger of the left hand and release it after starting to tighten the noose. For each posleduyushchego stitch the needle is put next to the previous one or two threads. In this case, the loop will be smooth and beautiful. When the bottom edge of the buttonhole sewn, turn the product so that noblity region was at the bottom. For strength in the corners of the loop is to set a small air loop of 2-3 stitches, that stitch across the slit and tight overcast stitches over the edge.Products in the underwear clips do on both sides of the loop, on dresses and blouses on one side. Wylacznie loop. The details outline the lines defining the length and width of the loop. The length of the loop should match the diameter of the buttons plus 0.2 cm Horizontal line marks the location of the buttonhole (Fig. 498 a). In the processing loop a single facing (Fig. 498 b, C, d) the last cut with the expectation that its length was more loops of 2-3 cm, the Width of the piping depends on the width of Kant. Iron the facing on two sides so that its width in the press it was equal to twice the width of the two edges. Press the facing applied to the front side of the main part, combining the bends of obrazek with the planned longitudinal lines. The ends of the piping needs to go over the intended line of loop size on 1-1,5 sm from each side. Obtachku pritachivajut on the car, fixing the ends of the lines.The distance from the lines to fold obrazek must equal the width of Kant. The core part and the facing is cut from the inside in between the lines, starting from the middle of the loop on both sides. Not reaching the ends of the loop at 0.5-0.7 cm, aligned dimensions do towards the end of the string, ending them at a distance of 0.1-0.15 cm from the ends of the lines. Through this orifice piping turn inside out the main parts, straighten the edges.The main detail in the ends of the loop are bent on the front side, the ends of obcutek tighten, straighten the corners and fix the ends of the loop of double machine stitching on the base corners (Fig. 498 d). When processing vitaclay loop two obrazkami them bend along the middle underside to the inside and iron the folds. 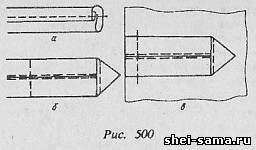 Piping is applied on the front side of the part bends towards the auxiliary lines and pritachivajut from the bend at a distance equal to the width of Kant. Further processing similar to the processing loop with a single facing. 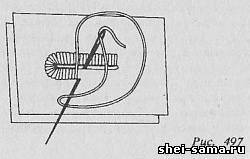 Loop of vetochnogo cord (rolica) (Fig. 499 a, b, C). Cord cut the length equal to the diameter of 1.3 cm buttons, plus a Loop applied to the front side part to the right side of the incision closure, evening the ends of the cord with the edges of the incision, and attach the reverse machine stitch or manually 3-4 stitches each end at a distance of 0.4-0.6 cm from the edge so that the stitch or stitches attaching the ends in the further processing were in the seam and not cut off when cutting the seam. Then, the slit edge of the zipper facing the handle. Loops from straight strips of fabric. Loops from straight strips of fabric performed most often on children's clothing (jackets, etc.) and in the manufacture of linen. To perform a loop cut out a strip of cloth with a width of 3.5 cm, the length depending on the number of loops. Strip length for a single loop should be equal to two diameters of the buttons plus 4 cm warp yarn of the strip should pass down the middle of the part. The strip is folded in half along the underside of the inside, equating slices, then tuck the slices inside and zastrugivajut at a distance of 0.1 cm from the upper bent edge (Fig. 500 a).Striped jotted edges cut into equal parts in length depending on the diameter of the buttons and fold in half across the strips, forming at the bend of the triangle, which is fixed at its base transverse of machine stitching or by hand (Fig. 500 b). Loop applied to the front side part to the right side of the incision closure, equalizing the ends of the strips with the edges of the incision, and attach the reverse machine stitch or manually 3-4 stitches each end at a distance of 0.4-0.6 cm from the cut edge so that the stitch or stitches attaching the ends in the further processing were in the seam (Fig. 500). Then, the slit edge is treated with a facing or podborta.